Ammersoyen Castle was built by the Van Herlaer family around the year 1350. 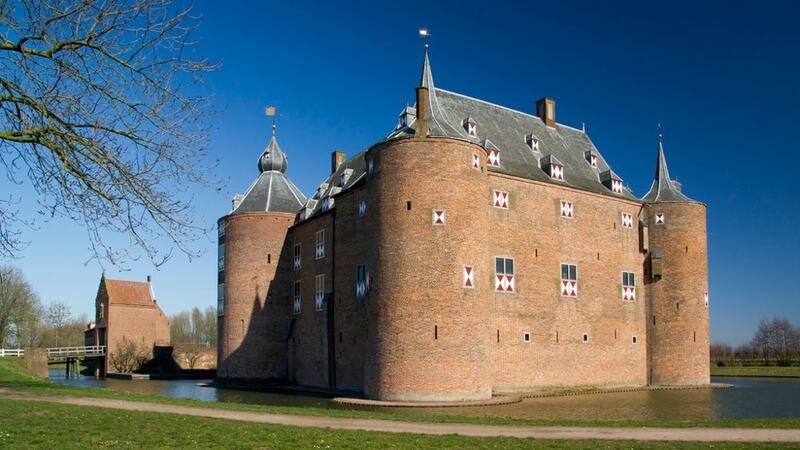 At the time of its construction, the castle was built along a branch of the River Maas. Just a few years after the construction of the castle was completed, the river was rerouted leaving the castle to be surrounded by a moat. The castle was designed to be a defensive fortress. When it was originally constructed, it had a central courtyard, surrounded by four heavy towers on the corners. To add to the security, the original design included a moat that ensured any attacker could only invade through the front of the fortress. Except for a brief period in the early 20th century, the castle has always been completely surrounded the moat.